I have a major thing for old children's books. My mom's sister taught school many years ago, and we have a large collection of her books. Nothing makes me happier than looking through a pile of Aunt Connnie's books. I always hang on to these kinds of books because of the charming pictures. This particular book actually came from a thrift store find of my mom's. It was full of countless stories. I've cut the whole book apart, and have used many of the pictures for decor. 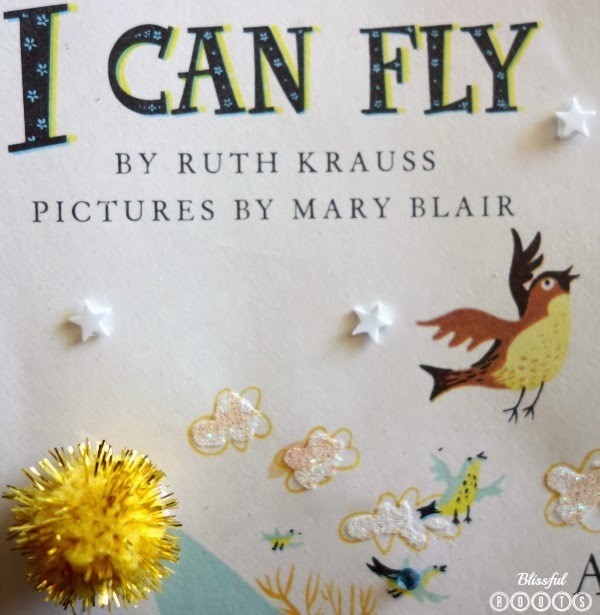 The story I Can Fly by Ruth Krauss was the very last story in the book. I immediately feel in love with the illustrations and the message the story had to share. Sometimes I just cut the picture out of the book, frame it, and then I'm done. But what I really like to do is embellish the pages a bit. I can't believe I forgot to take a 'before' picture of this page. 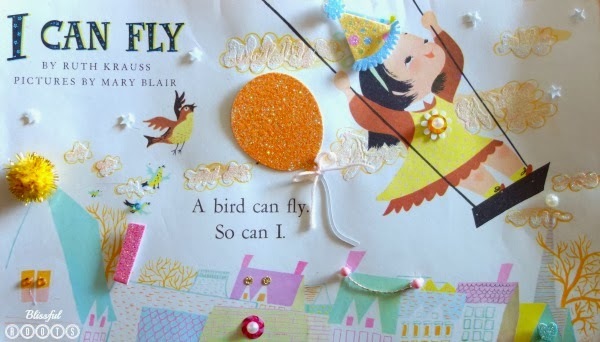 What you're seeing is the page with all my embellishments. Pretty much anything that appears to be three-dimensional is my doing. I like to use stickers (I layer them often times), glitter, cut outs from my Cricut, ribbon, string, pom poms, pretty much anything I have lying around that's small enough and cute enough. Here are a just a few of the things I embellished. I added a fun party hat sticker to the girl's head. For her dress, I layered a white flower sticker, a peppermint-type candy sticker, and then a white pearl sticker to finish it off. I added white stars to the sky (actually table scatter from the 4th of July), and glittered the clouds a bit. The balloon is a cut out from my Cricut with a little bow tied from embroidery floss. 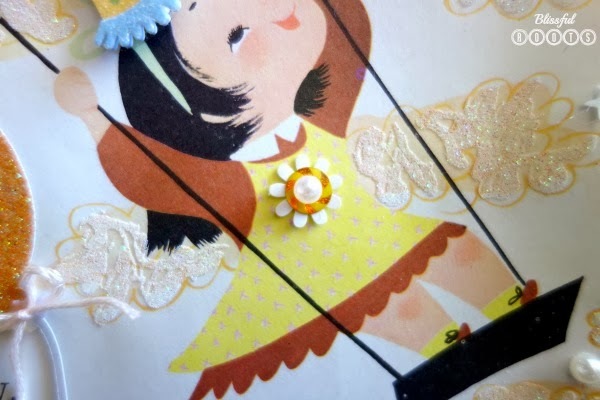 I try to not get too carried away with embellishments, but sometimes I can't help myself. I like to find things in the picture that naturally lend themselves to embellishing (her dress was screaming for a flower or something). That way the picture looks somewhat natural with a bit of pop, not crowded and gaudy. But, with that being said, it's so much fun to play around with the picture and all the different embellishments you have. They sky's the limit! Let your imagination run. Sometimes I frame these pieces of art, or other times I mount them on cute scrapbook paper or a canvas. I think this particular one would be perfect for a canvas. I can't wait to find a spot for it. This picture makes me so happy every time I look at it! And I made it for nothing. Simple pleasures! You can click here to see my Richard Scarry Storybook Dictionary alphabet set. Another old book I cut apart and used for decor. That one can actually work as a word wall (educational!) as well. 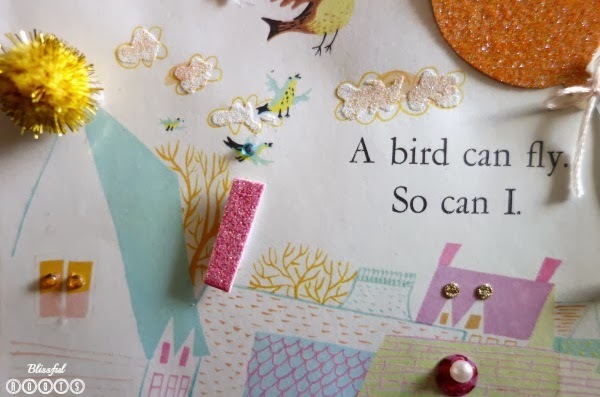 What do you do with old books? Love this! 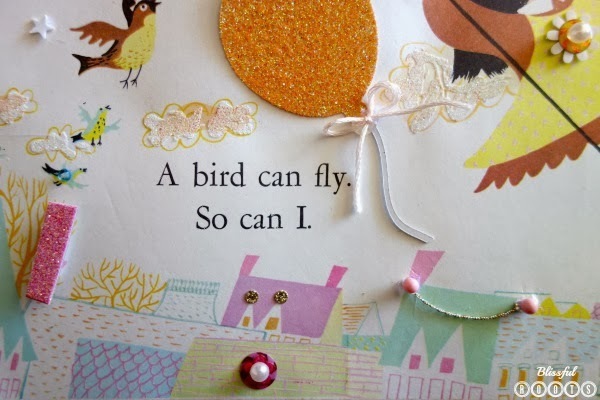 I LOVE pictures in old childrens books , what a cute idea to make them personal !! !love your blog! Thank you so much, Nakita! 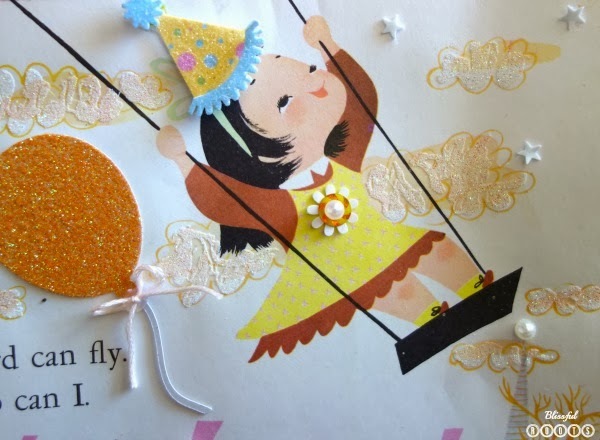 It's so much fun adding your own touches to something that's adorable to start with. So glad your enjoy Blissful Roots! I enjoy doing it. Have a wonderful weekend!